I am a novice needlepointer - who travels long distance frequently and likes to needlepoint on the flight. First - does on start at the top of a canvas - left to right (I am a right hander) or bottom to top - left to right? I like to start on the right and work left but someone told me it's the opposite. Second - I am starting a new Ehrman - with a lot of shading. on the very top edge where the color ends and the white canvas edge starts - can you stick in to the white edges to make a stitch? On some of the very small shaded edges I am not sure how else I would be able to make a stitch? Those are my questions - I have searched the web for these answers but no luck yet. Thank you for writing, Paul, and my apologies for the delay in answering. Where to start a canvas would depend on the type of needlepoint you are doing. If it is counted work, then generally one would start in the center (or as near to the center as possible). However, if the design is printed or painted onto the canvas then it is really up to you where you start. If you are working in tent stitch, as long as all the stitches go in the same direction it doesn’t really matter which way they lay. Basketweave (the type of tent stitch that is less likely to warp the canvas during stitching), is generally worked from the top right across to the left, whereas if you choose to work in continental stitch (another variation) the rows of stitches are worked alternately from left to right, or right to left. My advice would be to work in whichever way feels most comfortable, and to be consistent. Your second question refers to the edges of a design. Here again it depends on which stitch you will be using for your design. If it is anything other than tent stitch, then you will find that the edge of the work does not always give you room to add a complete stitch. In this case you would work a compensating stitch, or in other words, as much of each stitch as is enclosed within the pattern area, omitting the part that extends beyond into the white area of canvas. For example, the following diagram shows Scotch Stitch in progress. Each stitch is actually a block of stitches arranged in a square, shown by the blue square outline. 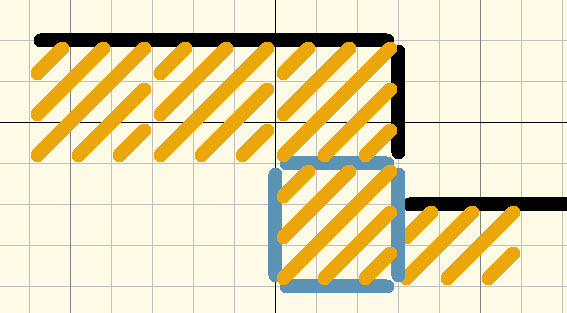 The edge of the area to be filled in this stitch is shown by the black line. You will see that on the right, the Scotch stitch would overlap that area if stitched in full. Therefore, only the part of each stitch that fits is stitched. The stitch on the right, in this case, is actually stitched as a rectangle. I hope this helps and that I have understood your question correctly, Paul.